Recently we sat down with Timothy Papandreou – Director of Strategic Planning & Policy at the San Francisco Municipal Transportation Agency (SFMTA) – and asked him about the challenges and opportunities in the city. Below is his response. We are a city of 120km2, so we are actually quite small. We have about 825,000 people in our city at night-time, and 1.2-1.3 million during the day, so we fill in a lot. And we’re in a region of seven million people. So we’re a small city, but we are a junction for regional trips. The biggest issue for us is therefore integration. We need to integrate all of the transport options, otherwise we’ll have sheer chaos. So the local transit feeds the regional transit; the regional freeways feed the local roads, and vice versa; and the bike network is contiguous, although it needs to be fixed, because it doesn’t connect everywhere. 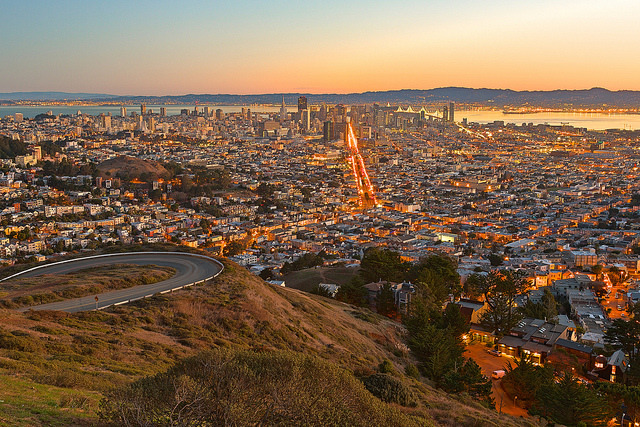 Sunrise in San Francisco. Photo courtesy of Nicolas Raymond via Flickr. The challenge that we have is keeping that integration going, and then getting the political and community support to make changes on the street, so that bicycling, walking and public transport can be prioritized. We have to work with small businesses, who are very concerned about losing parking and how it may affect their businesses. We also have to work with the community groups to make sure that the bus routes and bikes and trams are actually going to work for them, and we are not forcing it into their corridor just because data says that we should. It is about marrying the data-driven process with the community-driven process, and making sure that they work. In many instances, the political leadership is there up to a point: they are there at the high-level strategic policy level, but when it comes to the specificity of the street change, they are not exactly there, or they are concerned. So one of the things we have done as a solution is to test a lot more pilots, where we no longer build permanent infrastructure; instead, we test it with paint and local materials that we can salvage from the Public Works Department or something like that, to create the barriers that we need to test the bike lane or the bus lane or whatever it is. Then we will do data analysis for a year-and-a-half, to go through four seasons. Then we report back to our Board to show how it went. Most of our pilots have successfully led to the capital project’s being implemented, with a few tweaks. Very few, but some, have led to a massive change, because we just didn’t know until we tried it out. What that does is, it gets us out of that stalemate of: we won’t know unless we try; we don’t want to try because we just don’t know. So rather than talking about this in policy-level, abstract terms, we can actually apply it in the real world and see whether it physically worked or not.